Dubai Industrial Park today officially inaugurated the world’s largest integrated electric and electronic waste (e-waste) recycling facility ‘The Recycling Hub’ by Enviroserve. The special launch event was held under the patronage of Sheikh Nahyan Mabarak Al Nahyan, Minister of Tolerance. It was attended by senior government officials, industry leaders and business partners. Stuart Fleming, group CEO of Enviroserve, welcomed the distinguished guests and visitors. The guests toured the state-of-the-art 280,000-sq-ft e-waste recycling plant, which processes WEEE (waste electrical and electronic equipment), IT asset disposition (ITAD), refrigerant gas, and specialised waste. The recycling facility’s mechanical separation process is chemical-free with industrial air filtration, allowing for a 96% recovery rate with zero air and liquid emissions. To put things into perspective, this means 38,000,000 kg of e-waste will be kept out of landfills each year. A centre of expertise for electronic waste management in the region, Enviroserve has already begun processing electronic waste for its partner Epson. 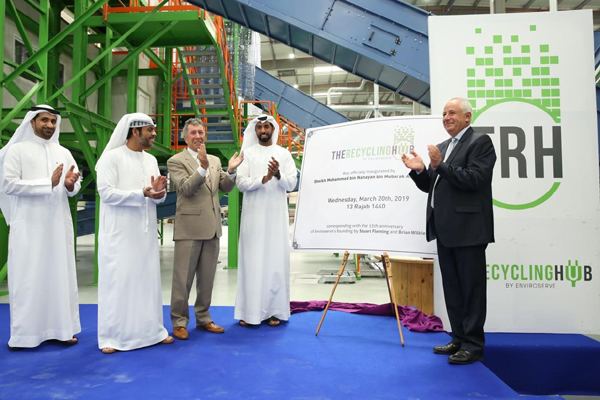 During The Recycling Hub’s launch, Enviroserve announced its partnership with Nespresso to recycle all of the coffee giant’s aluminium capsules and machines in the UAE. Also during the launch event, the company announced a regional partnership with Lenovo to recycle and refurbish the latter’s electronic products.